Every year we ask students to complete our housing survey, so that we can keep track of the cost of student rent, to ensure we provide a competitive service at our very agency, SUSU Lettings, and so we can give you the information you need to pick the right place for you. You can find the results of last year’s survey here. 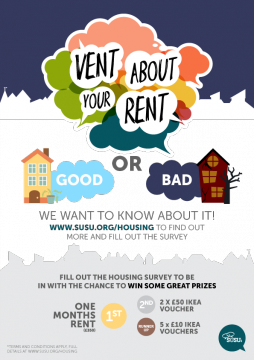 If you complete the survey, you will be entered into a prize draw for a chance to win 1 month’s rent (£350). We will also be giving away 2 x £50 Ikea vouchers and 5 x £10 Ikea vouchers – not bad, if you want some new stationery or furnishings! Ok, so where do I fill it out?